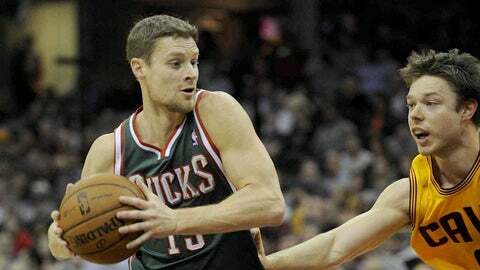 Cleveland, OH, USA; Milwaukee Bucks guard Luke Ridnour (13) dribbles the ball against the Cleveland Cavaliers during the second quarter at Quicken Loans Arena. CLEVELAND — The Milwaukee Bucks don’t seem to know who’s going to play for them night to night. They’re not really that good when they’re entirely healthy. They’re not an embarrassment, because they really get after it. We saw that Friday, when they dropped a 114-111 decision in overtime at Cleveland. The Bucks really had no business playing the Cavaliers that closely. The Bucks were on the road, they used what coach Larry Drew uncomfortably described as "nine healthy bodies," and they started two guys whose names no one can pronounce or spell. They also came and left with the NBA’s worst record (now 5-21). Here are the folks Drew had at his disposal: Khris Middleton, John Henson, Brandon Knight, rookies Miroslav Raduljica and Giannis Antetokounmpo. Say that five times fast and it will sound like a sneeze. But take a look at the starters and you see two first-year guys, two second-year guys (Middleton and Henson), and one third-year guy. "I thought our guys played really, really hard and were very, very competitive," Drew said. "As short-handed as we were, we still fought." It didn’t end until O.J. Mayo came off the bench and missed back-to-back 3-pointers in the final seconds. The second of those was the type of wide-open job he normally buries. "The second one, man," Mayo said. "I didn’t know I had that much time. I kind of rushed it. I would take them any time of the day. I should have made that." I thought our guys played really, really hard and were very, very competitive. Still, you can see the promise and plan here, and that’s what you’re looking for in a young team that’s finding its way — and doesn’t really know how to win. Henson scored 18 points and grabbed 10 rebounds, performing with endless desire and a winning mentality. Middleton went for 14 — and Knight, a point guard, scored 17 with an amazing 10 rebounds. These kids, it is clear, play with tons of heart. Imagine them with a high draft pick and a Jabari Parker, Andrew Wiggins or any other of the top college stars next season. Friday was proof that the Bucks may be bad now, but they could become relevant quickly. "We just have to keep with the same habits and know that we’re still a fairly new group," Knight said. "We just have to continue to fight and make sure to remember not to put our heads down." It sounds like a good idea, a learning experience that’s not always easy, but necessary. No shame in that. Not if you play like these young Bucks did Friday. For this team, this season, there may not be anything better than learning, keeping things close, and losing.